I really think I put up my Christmas decorations too early this year -- as in the day after Thanksgiving. Next year I'll push myself to wait. Advent is about waiting, and I really could have used that time before Advent to remain Christmas-free so I wasn't itching to put everything away now, when it's actually still Christmas! 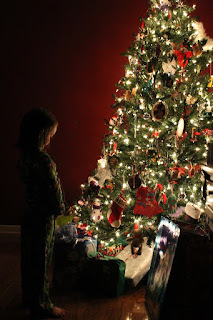 The 12 days of Christmas begin on December 25, and they end on January 6 with Epiphany (or Three Kings Day). We celebrate that in our house, so it feels a little wrong to have put away all the Christmas decorations before that finale. So I wait. But oh, the nester in me would like to get started with the boxing and the wrapping next year's Advent books. I'd like to clean and organize and start other preparations for our 2016 changes. But my waiting continues. I'm trying to enjoy the lights and decorations a little longer. I have done a few organizational things unrelated to Christmas stuff, and I've got quite a pile of wrapping-for-next-year, my Xmas books and other bits and bobs started in our bedroom as a staging area, waiting for when I do get the boxes and really start putting things away. Even after I complete my Christmas boxing there is more to do. Closets to organize, furniture to move, etc. It's quite daunting no matter what, and I probably have another somewhat big job starting in January that will take up a lot of my child-free time. How long do you leave up your holiday decorations? Do you think I'm being crazy for waiting to put mine away? I got a lot of great Christmas gifts this year, including a Fitbit Flex from my mama. It was on the top of my wish list, and she even got me one with a purple band! These things came out in 2013, but I'm not what you'd call an early adopter (big reasons why are being cheap and wanting a product with at least some of the early kinks worked out). I don't have any "friends" in the Fitbit system, and I prefer it that way. As an online writer/blogger I do put some of myself out there, but I definitely don't give away a lot of minutia or anything really private. So the idea of anyone seeing how much I walk (or DON'T walk) in a given day is horrifying. Do your friends have access to your sleep data? Ugh. I like the sleep tracking feature, although I'm not sure how accurate it is. I had a REALLY hard time falling asleep last night but it still shows me as getting a full 8+ hours. I definitely was laying down and in bed for that long, but I don't know about asleep. It's based on how much your wrist moves, and honestly when I'm laying there reading on my Kindle Fire (another great Xmas present from my mom a couple years back!) my wrist doesn't move much so maybe it thinks I'm sleeping then? Data is data, and even if it's wrong it's still wrong consistently and I can spot trends. Do you have a Fitbit or another exercise tracker? Do you like the motivation of other people seeing your stats? I told a friend about our tradition to open a Christmas book every night of December (until Christmas) as part of our Advent celebration. She has two kids but said they don't have that many Christmas books. We have WAY more than 24 because we acquire more every year and started from more than zero since my mom had saved a LOT of books from my childhood. There may have been more too if my sister took some (first crack since her kid is 7 years older than Jane -- can you believe Owen is ELEVEN?!?!) -- or maybe I got them all. In any case, we've got a ton. I offered to make a list of some of our favorites, so I thought I'd repurpose that list as a blog post too in case you're looking for some kid Christmas books (or just have an interest in what Jane is reading in December). This is a vintage book (that's a nice way to say old right?) featuring Big Bird. It's long, so not a favorite for me and Shawn to read, but Jane likes it. No overt Santa message - just Big Bird corresponding with his Grandma and making her a special present. We actually have two copies -- one that came with a cassette tape of the story. Don't have the cassette and should probably just get rid of one of the older one. The other I am pretty sure I bought before Jane's first Christmas for a photo op. Board book, short and cute about the animals in the stable getting ready for the Holy Family's visit. Lift-the-flap board book, short and easy to read. A little babyish for Jane this year but she still likes it. Small book with these button-like Christmas trees cut out of the book. Short, rhyming and probably old. Weird, and Jane likes it a lot. Long but Jane loves Thomas! One of the first ones she opened this year and she loves it. She likes to tell the story, assign roles and act it out. The mystery is that Santa delivers presents to the wrong houses and they have to sort that out. Animals on a farm tell the Christmas story with a focus on the animals' roles. Short and easy to read. Paraphrase of the Bible story with cute pictures. Has a Borders tag on it so maybe we got it on sale when it was closing? No Santa in this one - it's about Pooh giving away his honey as gifts for his friends. And he gets honey from them in return -- hence the sweetness. Jane likes this one a lot too, although the mystery book gets more retellings. Board book that's just pictures of babies dressed up with brief captions. Pretty sure I got this at a garage sale. Old copy from my childhood. We read it for the first time this year (this one hasn't been wrapped so far). Jane loves this one, and it's random and seems old. I don't remember it from being a kid so could be a garage sale find or just something my mom picked up along the way. Or my Swiss cheese memory could apply to childhood books. It's about a cat who climbs a Christmas tree and talks to ornaments along the way. Weird and long. Babyish book that I got at a Scholastic outlet store one year when a friend took me. It's in Baton Rouge on the outskirts somewhere and parents who volunteer at book fairs and teachers get to go shop the overstock. It was really fun. I haven't been back though -- that friend has much older kids (there were books for all ages) and I haven't pestered her about it again. A Disney book about the donkey who carried Mary to Bethlehem and his life before that. It's a movie that we watched every year as a kid, so it's sentimental. The book is old, but I'm not sure where we got it because I don't remember having a book version when we were kids. Maybe I found it at a sale and got it (or my sister did). Easy to read, rhyming alphabet book. Definitely vintage. This was a gift - about the night Jesus was born. I love Poky and bought this for Jane probably her first Christmas. Shawn hates this book and was glad it was the last one she happened to open this year. This was a gift and is beautifully illustrated. Lots of text. We have a couple versions of this - I think both from when I was a kid. I definitely bought this one, and it's short with a padded cover and sturdy pages. Not quite a board book but good for littles. Lots of shiny stuff on the pages too (but no glitter). Hallmark book, so probably was a gift or a hand-me-down. Lots of text - about penguins and snowmen putting on a play. Beautiful pictures. About a camel carrying the wise men's gifts and then also giving a gift himself. Love it (not many wise men-themed books really) but they meet the baby in the manger, which is not how the Bible story goes. Otherwise good one, and I think it must have been a gift because it's a nice, big book. Old, has a music feature that barely works anymore. Rhyming and short board book. Sparkly with sturdy pages but not a board book. Was a gift and doesn't have many words. Not really Christmas but lives with our holiday books (doesn't get wrapped). Got it from Jane's teacher last year. Paperback Little Golden Book originally came with a cassette. A lot of text and more than the song - but it doesn't follow the movie either. I should probably get a new version because Jane likes Rudolph a lot (but that kind of goes against my no Santa myth stance). Garage sale or hand-me-down find. Story about boy making a snowman that comes to life at night and they fly around the world. Board book, easy to read. Love the characters and her paintings. We have a couple versions of this -- gag me. I guess it's the length that I don't like? The nicer copy was a gift and the other copy is a random one from when I was a kid. Definitely garage sale or my sister clearing out her classroom book. This isn't a Christmas book either, so doesn't get wrapped but does live with the holiday books. Board book with things to feel. Soft cover from Scholastic book order I think. Rhythmic and rhyming text with good illustrations. About Llama Llama melting down from all the holiday stuff and getting a cuddle from his mama to make things better. Has buttons to push to hear music, and it's about a group of animals doing a Christmas concert and getting ready by practicing at their homes. Push the buttons to hear individual instruments (named in the text) and then the last button is all the instruments together. Not recognizable Christmas music, but not annoying or tinny either. We really like it. Photos of a deer family as the season changes and made up text about what the baby deer is thinking about with his first experience of snow. Pretty pictures, but not my favorite. Also not Christmassy so just one that lives with the holiday books. Paperback Little Golden Book definitely from my childhood. Story about a group of animals going on a sleigh ride and they pick up more animals and sing Jingle Bells. Meh. Raining on Sesame Street for Christmas so the friends tell different stories. Lots of text - way too much. I think this is from the 80s. Funny little story about a dog who lives in a junk yard and gets a Christmas tree and decorates it with trash. Not sure where it came from, but it seems old. Definitely vintage and kind of long. They give each other gifts at the end. Amazon affiliate links used. If you click on one and make a purchase (of anything) on Amazon I theoretically get a small payment at no cost to you. I saw theoretically because I've never received any income. Jane and I have been crafting a bit since she's been out of school for the winter break. We've mainly done Pinterest crafts that used paper plates, construction paper and pom poms. We've made a Santa face, a Rudolph and an ornament decorated with tissue paper. They've turned out really cute, and we have a couple more options to do (Christmas tree 1, tree 2 and chalk lights). 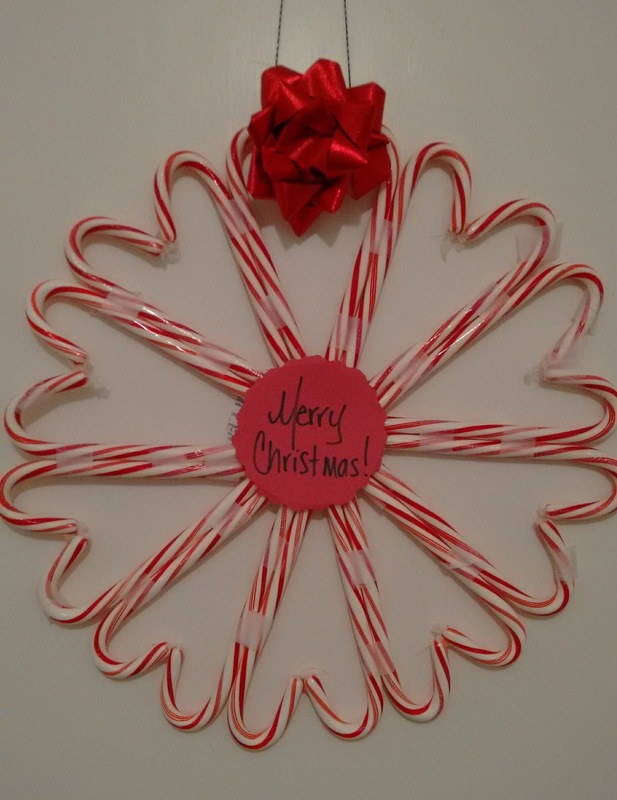 I attempted one craft myself - this Merry Christmas wreath made from candy canes. Unfortunately it's just a picture, and the comments on it are saying it doesn't work. 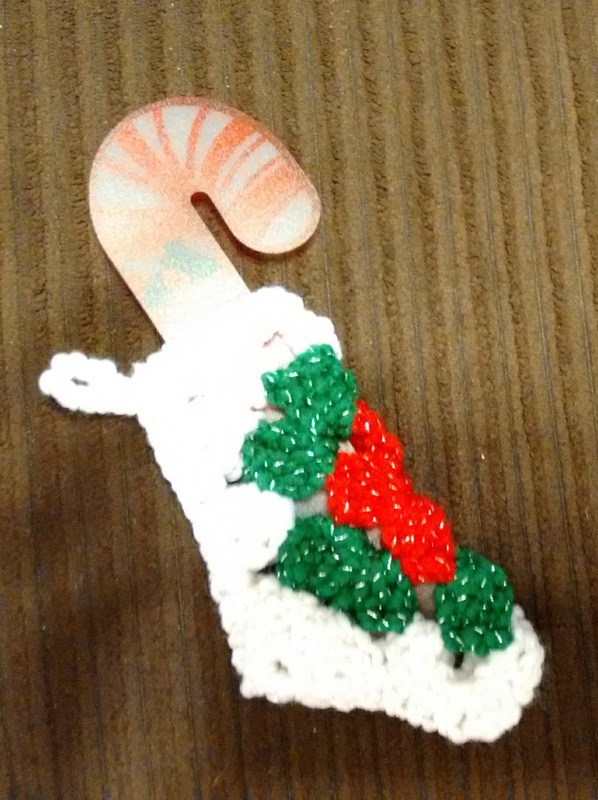 I had to try twice -- the first time I miscounted so had two too few candy canes and some of my hot glue didn't hold. But I just finished try #2 and it seems to be holding up OK now. I cut circles out of the candy cane box cardboard to make the center stabilizer. Also in the original picture you can see the tape used to connect the candy canes, so I did that first - taped them in sets of two/back to back. Then I used hot glue to connect the tips, forming the hearts. I added more tape for security (and where I broke the candy cane crooks - this is not a re-usable wreath for sure). I hot glued the cardboard circles over the middle - one on each side - and then glue sticked the construction paper "Merry Christmas" label on one side. I used my fancy edge scissors to cut around that one to make it look cuter, but I'm not sure that's visible in the picture. I used a piece of glittery black string that I have from Gran's crochet stash and threaded it through the top and taped it behind the door/inside the closet to hold up the wreath (you can see that better in the original). I added a random red bow to the top, but I'm not sure it's going to stay with just the tape, and it isn't necessary. 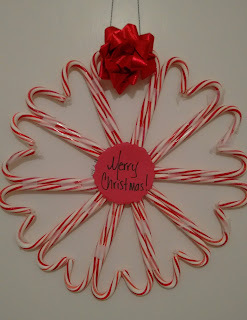 I also taped a few of the candy canes to the door to keep the wreath from flopping around when I open the closet (I rarely need to get in the linen closet, but now there's a delicate wreath there I'm finding I need stuff constantly!). Hopefully it will last three days until Christmas, and it's a small investment so no worries if it doesn't last. It's just going to be tossed anyway. Total cost was $2 for the candy canes ($1/box) and I had everything else on hand. I'm not sure how much the glue gun sticks cost because I'd bought them for another project, but I probably used 2 or 3 per try so 5 or 6 total. Economical and cute! We normally go to Zoo Lights at the Baton Rouge Zoo to get our fill of Christmas lights, and we still will probably try to hit them up (if this rain ever stops), but this year we thought we'd try something a little crazier and drive to New Orleans City Park for Celebration in the Oaks. It's about an hour and a half drive, and the park opens for the lights at 6. We left at 4:30 and stopped in Gonzales on the way to eat supper (Cracker Barrel 4 Life ... even when it lets us down we can't quit it!). We were at the park by 7, and because we went on a Thursday were able to find parking without too much trouble. It WAS crowded, but that was to be expected and kind of added to the festive atmosphere. The weather was cool but not cold -- probably mid-50s. So our coats and hats were welcome but we weren't frigid. I didn't take pictures of the lights really, since I wasn't thinking blog post but was thinking "what photos will I want to see later," and those all include Jane! 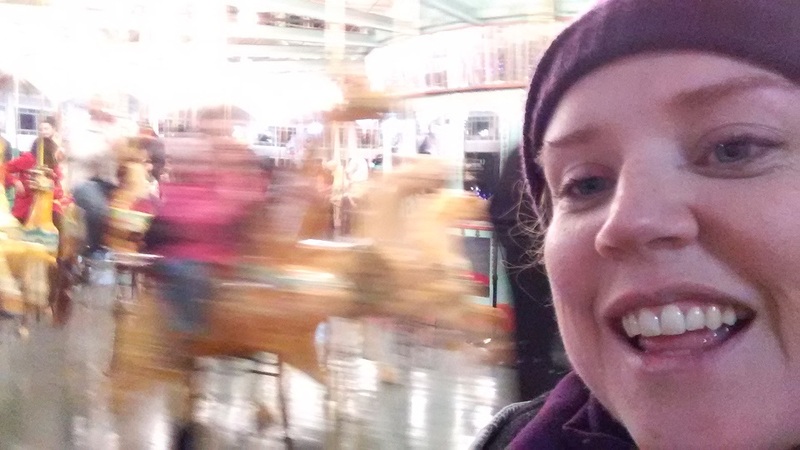 I did get a funny selfie of me as Jane and Shawn flew past on the carousel -- I couldn't believe how fast that thing went! We also did the train ride, which was worth the $15 for the three of us. We could see more of the lights, especially the Cajun Christmas scene with Santa in a sleigh with alligators instead of reindeer. That made me laugh. The park was too big for us to see everything, although we didn't leave until after 9. We still had a drive home ahead of us (and Jane's NORMAL bedtime is closer to 7/7:30 when we arrived! ), and I was dragging as the effects of a cold hit me full force and I had no voice left as we hit the exit. Jane said her favorite was the waving Santa, a huge light display near where we parked. I liked the Cajun Christmas and also the section that was timed to light up alongside music. The park equipment was fun -- a slide and some play houses -- although a little dark to really be playing, much to Jane's disappointment. There were plenty of other rides too, so we may have to go back to the park in the spring or fall when it's a better temperature and less crowded to do some of those things. Although some looked too intense for Jane so we might want to wait a couple years on that too. One thing that tickled me, and made me think only in Louisiana, is that alongside the hot chocolate and coffee they were selling Bud Light tall boys and you saw plenty of people walking around with them. LOL at open carry laws in other states. Good grief. Jane's class has two teachers, plus there's the director of the preschool who is often in the classroom with them. There were also three student teachers (aides?) this semester, but they stopped working two weeks earlier than school ended, so I didn't get my act together to make them anything. One of the student teachers stayed on so I did make her one, but in retrospect I should have come up with some other gift for the student teacher workers. Good grief. Anyway, I made these cute coffee cozies and paired them with a Starbucks gift card ($10 each for the main teachers and director and $5 for the student worker -- still enough for one drink!). 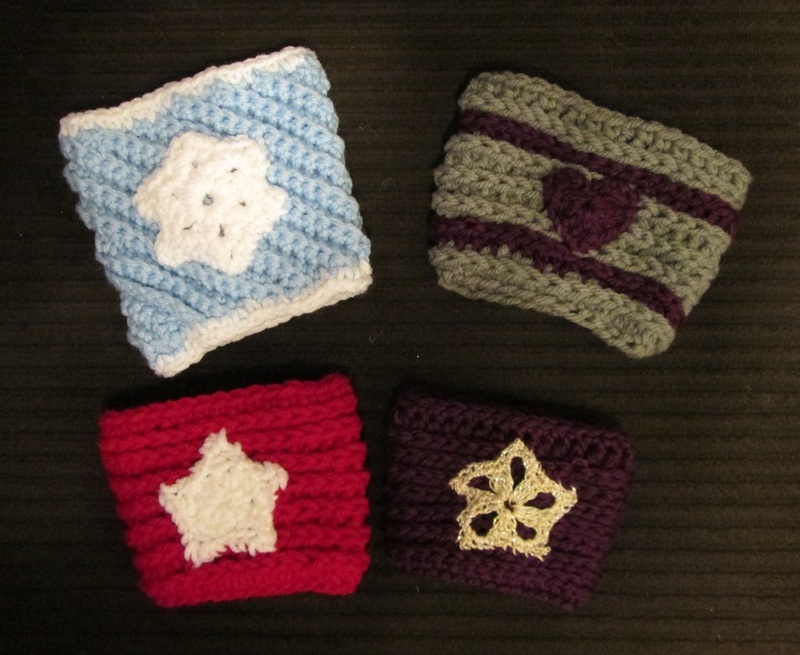 I used the 15 Minute Coffee Sleeve pattern for three of the cozies and the Crooked Coffee Cozy for the fourth. The 15 minute ones were great and sized just right, but the crooked one was a little big height-wise. I probably could have changed hook size to get it better sized. In any case they all worked on my grande Starbucks cup that I kept around for testing. I made an assortment of appliques to give the cozies an extra touch. Jane picked the silver star for the dark purple cozy (for the student teacher), and I let her choose who got which cozy. 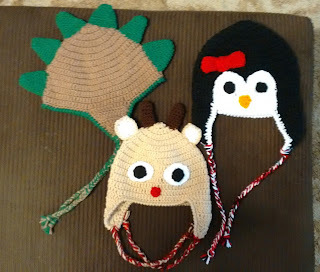 I just used scrap yarn, so the only cost was the gift cards themselves (i.e. the real gift!). I did buy small boxes to put them in because I had a pretty good CVS coupon and was out of small bags. I'll have to restock my wrapping supplies on Boxing Day. I might be more excited about that shopping day than Christmas itself (! ), although I am certainly looking forward to Christmas and giving Jane her gifts. A friend of a friend of my mom's is fighting her second round of cancer. She needed some warm hats, and THAT is something I can help with. These aren't my best work, but they're not my worst, and they're all warm in their own ways. The grey and purple stripe beanie is made with a wool blend for the grey so it's softer and warmer than my usual acrylic. It's also the most understated. The blues is made with Caron Simply Soft, which is a very soft acrylic, and I held two strands together so it's doubly thick. The earflaps give even more warmth, and the granny square star applique adds a little fun. I think my favorite is the breast cancer awareness beanie. I got the pattern for the ribbon on Ravelry, and I just made a single crochet cap. I should have done half-double crochets, but I mis-read the picture with the pattern when counting the rows they used. I knew it was too many rows for double crochet, but I didn't remember hdc. Single crochet makes for a denser fabric though, so it makes it warm, so happy accident! I did hdc for the pink rows around the brim, and I made my ribbon with hdcs too since the double crochet version seemed a little too big. The medium pink doesn't look as peach in person. For some reason it didn't photograph that great (imagine that, since I took the photo in my living room under the ceiling fan at night). I just hope these will fit because I based them on the "average woman head" from the chart I use to size hats. I'm sure it's different when you don't have hair. They could all SQUEEZE onto my head, and I have a huge head. So hopefully they aren't TOO big. We'll see how it goes. I can ALWAYS make more, and I've got a ton of extra yarn floating around that would be great to get use up! It's been a year since I've talked to my Gran. A year since she died. I still think about her a lot and have many of her things around us. We use forks from her house, have a huge piece of artwork that hung in her living room, several pictures and lots of crocheted items. The initial sting has faded, and the certainty of her being with Jesus and at peace makes it more bearable. I do believe we'll be together again, even if I don't understand how it will all work (or perhaps is working right now). I don't doubt her love for me even if that quick reassurance of "Love You Forever" is no longer a phone call (or 11-hour drive) away. Jane has a Christmas book, The Greatest Gift: A Story of the Nativity. It's a recordable storybook that my sister worked with Gran in 2013 to create a cherished keepsake. I am planning to record it somehow digitally so when the book does finally fail I won't lose the sound of her voice. Sometime in college I did an interview with her for a project, so somewhere in the depths of my stuff - either here or at my parents' - there's a micro-tape that I sure would like to listen to again. Jane loves the book and listens to it a LOT, being tickled that she says "A gift for Jane, read to you by Meme." 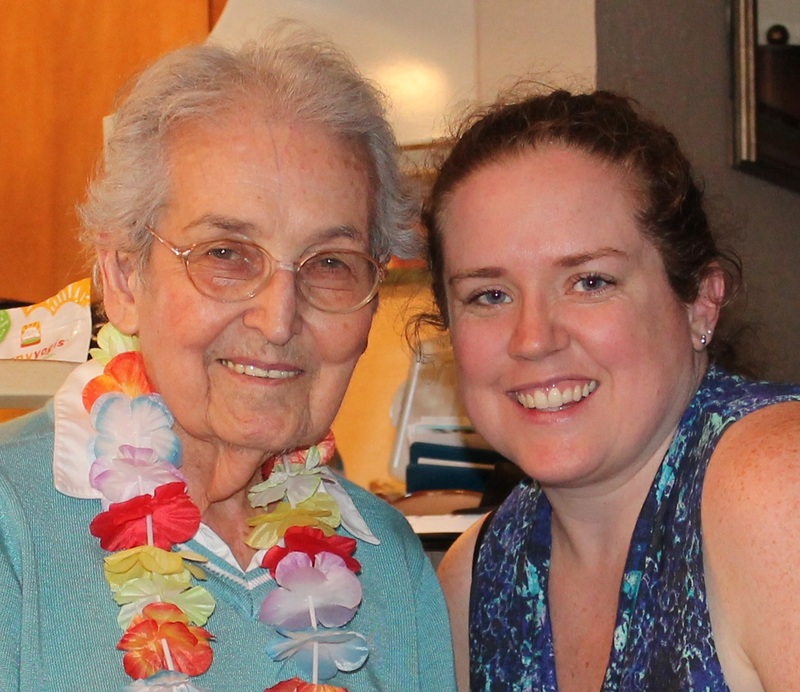 Jane received the blessing of Gran's direct love, and even if she won't remember I will never forget. I finished these matching "Frozen Heart" crochet hats for my cousin's daughters as surprise Christmas gifts. Now to mail them. I am DREADING the post office run I need to do. I finally have all three big packages ready to go, so I should get on it. 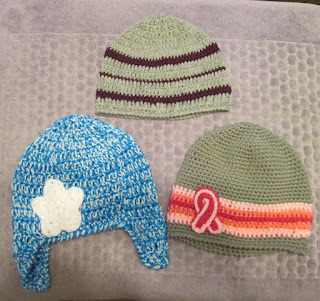 The hats are made with Caron Simply Soft that I happened to pick up on sale sometime this summer. Shawn came up with the "Frozen" label since the colors are very Elsa. I made the little one first and was surprised HOW little it is. I followed the pattern exactly, and it's labeled "toddler sized," but still came out only about 16" circumference. I think it still might be too big for the 1-year-old, but baby heads grow and I bet she has a big brain! I added 10 stitches to the increase to get the bigger size and used Jane's head for gauge (she's six months younger than the older sister). So the little one has 7 hearts and the bigger one has 8 hearts. I like the dots border pattern, although I ran out of light blue for the big hat and used some white to finish up. I actually like that addition. I hope the girls like them! I got another silvermari crochet hat order - three hats to give as Christmas presents. I don't know exactly how long these took me, and I am able to work while I watch TV, but doing exact measurements I often have to rip out multiple rounds. 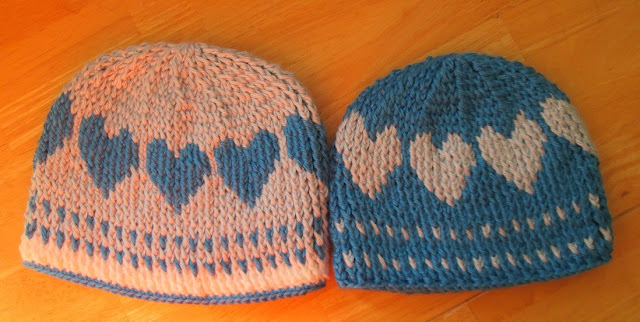 I think each hat base took at least two times to get the right size. Perhaps I should make notes on what hook size and number of increases I make to get each circumference size! Whatever the total amount of work I'm certain I need to increase prices. The hats with faces are $15 and the non-face hats are $10. This is much lower than prices of similar style hats on Etsy. The dinosaur takes just as long to crochet and sew the spike pieces as a face would take. So maybe I should have two categories - simple and involved, or something like that? I'm not overrun with orders right now, but it could get to the point where I really resent the amount of work for the amount of pay. So far it's OK because I have existing relationships with those who order hats. I don't know that I will actually increase prices, although the new year might be a good time to do it. To get myself back on a crochet page, so to speak, I thought I'd schedule a post-NaBloPoMo post about my latest FO (finished off project). 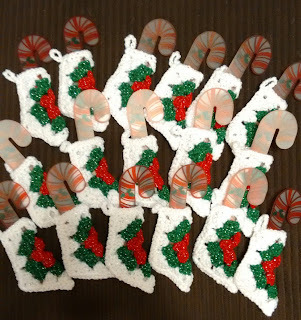 I made 17 mini stockings for Jane and her classmates. I have no idea if they'll celebrate Christmas or have a holiday party or what, but I'm sure I can send them with her the last day of class even if not. My Gran crocheted things like these for Owen's classes when he was little (and maybe for my sister's preschool classes too?). She cranked out a TON of them that's for sure. I looked up a mini stocking pattern, but it used double crochets in groups of 4. I had a stocking Gran had crocheted to look at too, and hers was so small because of her tighter tension and maybe thinner yarn so I used half-double crochets in groups of 3 to get closer to the size of her stocking (mine was still a bit bigger). I tried a few yarn combinations but ended up sticking with that colors she did. But my yarn has a little silver sparkle thread running through it. Jane thinks it looks fancy! 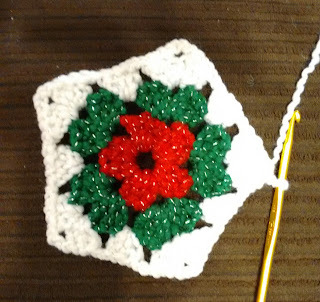 Basically starts with a five-point granny star with three rows. Fold it and sc around, add a hanger (ch8, sc in 8th ch from hook) - voila! 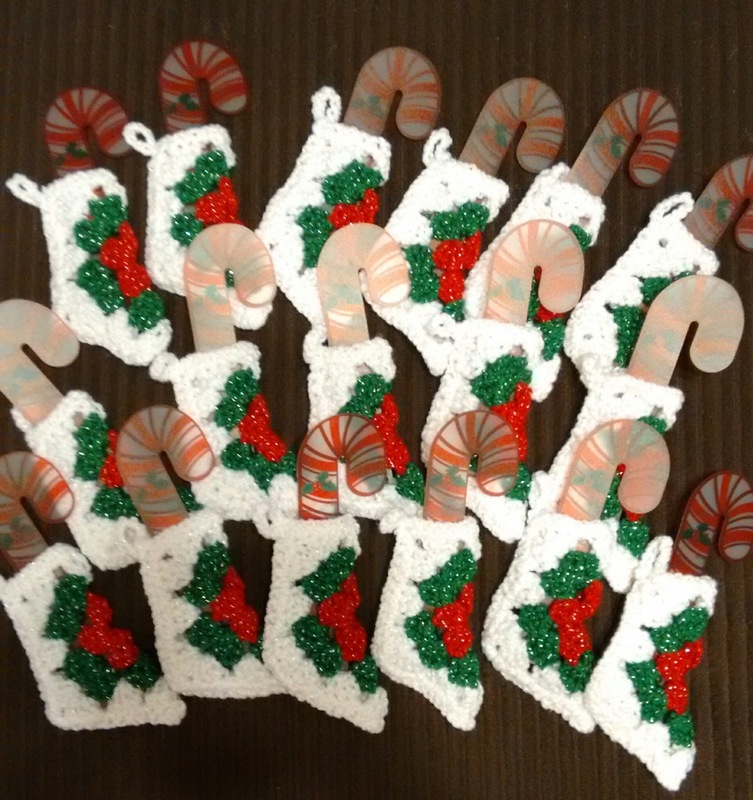 17 mini stockings with candy cane bookmark rulers! I have another Christmas-related crochet project for Jane's teachers, plus I'm finishing up a 3-hat order (reindeer, dinosaur and penguin). Making hats to exact size is MUCH harder than just winging it like I do for all the hats I make for faires. I'm trying to create a pink chevron blanket to fit on Jane's twin bed, but I'm not sure if it will be ready for Christmas. It's a LOT of double crochet, but it looks awesome and is easy/mindless. I'll post those projects as I finish. Do you have any Christmas crafting going on at your house?